The BioRowTel system measures the most essential components of rowing technique in the most practical, accurate and reliable way. Can be quick to setup on any boat - just follow the setup instructions! The system has a scalable design, where the main Master unit can be connected to a chain of extension units – Slaves. The Master unit provides power for all sensors, collects and records the data. The BioRowTel software brings you all of BioRow's experience and technology, ready to go. It provides a unique averaging algorithm, which allows unambiguous analysis of large quantities of rowing data, easy comparison and evaluation of various samples (rowers in a crew, various stroke rates, previous and current data). The calibration of the oars takes about a minute per oar and allows an accurate and reliable calculation of rowing power. A 2D oar angle sensor which measures the movements of the oar shaft in horizontal and vertical planes. This allows the definition of the track of the blade relative to the water, hence allowing us to obtain values for catch and release slips, as well as effective angles. A position sensor of the seat and shoulders. 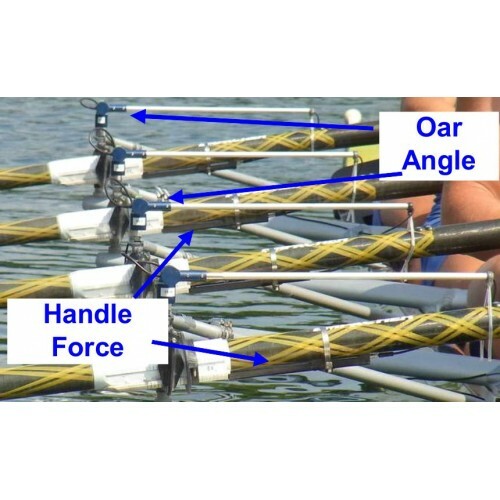 This allows the derivation of the velocites of different body segments (legs, trunk and arms) and their power contribution into total rowing power, which defines rowing style and allows in-depth analysis of rowing technique. Wired handle force transducer. This is accurate, reliable, light (80g), inexpensive and can be quickly attached to the oar shaft, so it works with any oar, sweep or scull. 8D Wireless handle force sensor, which works similarly to its wired analogue, but sends data through Bluetooth and has a 3D accelerometer, 3D gyro and an external input for another wired force sensor, so it fully defines blade movements. It can also be used in kayaking. Instrumented gates (both sweep and scull) are available for long-term monitoring of rowing technique. 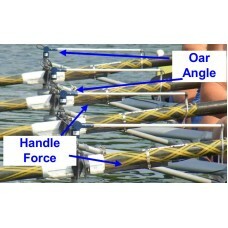 They measure 2D force in the oar reference frame and the angle of the oarlock.